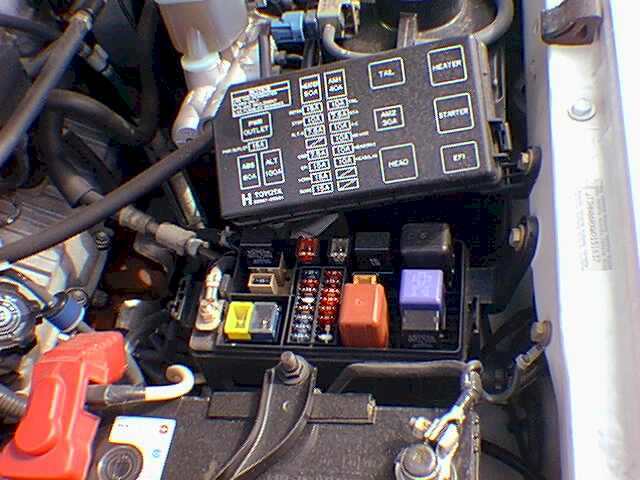 This is a view of the 4Runner's underhood relay center: Toyota calls the ECM's power relay the EFI relay and it is located on the bottom right. A slight tap was all it took to close the contacts. 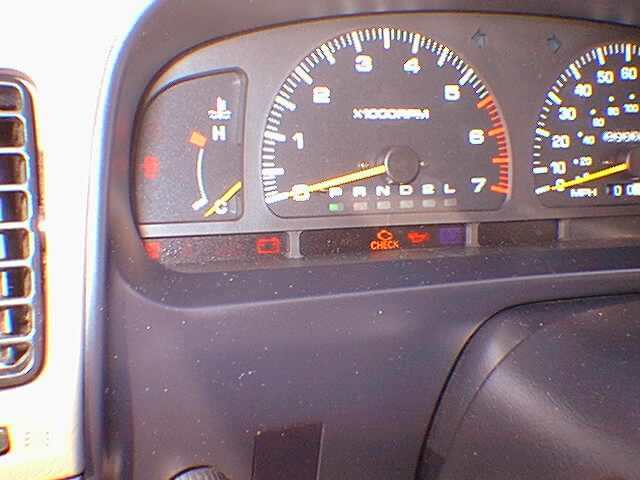 Here is a view of the check engine lamp, when it lit, on the 4 Runner. Always try to check to see if the check engine lamp illuminates when the key is cycled on. Finding the solution to an intermittent problem is as simple as asking the right questions. It doesn't happen all the time!" Do you also cringe when a customer says this? For many of us, intermittent problems are a love/hate relationship. You hate the large amount of time you must spend testing or even test-driving the vehicle. On the other hand, once you have figured out the problem, the solution can bring an overwhelming sense of satisfaction — one that many technicians live for. An ‘intermittent' is generally a problem that occurs at least once per day. That said, you first need to qualify the problem. The initial question to your customer requesting service for an apparent intermittent problem is, "Just how intermittent is it?" Forewarned is ‘fore-armed': If the customer describes a vehicle that is symptomatic only once or twice a week, don't waste your time. This vehicle actually has what many call a ‘random problem,' and this is not an ‘intermittent.' If you dare to diagnose a random problem, you most likely will spend a lot of time test-driving the vehicle just to see if the problem rears its ugly head. In a polite way, advise your customer that the vehicle must be symptomatic at least once a day in order to efficiently and economically diagnose it. This notion may be difficult for the customer to comprehend. At our shop, we have developed a handout to help explain this concept to customers. Once you determine there is a legitimate intermittent problem, ask the customer as many questions as possible about the nature of the problem. These answers will start painting a picture of the problem, and, in the blink of an eye, you can start working on a solution in your head. Most intermittent problems fall into one of three categories: The first is an intermittent no-start problem. In this case, ask the customer enough questions to determine if the engine is actually turning over when the problem occurs. The answers will tell you if you can eliminate the vehicle's starting circuit as the problem. I wish I had a dollar for every repair order that was written up as, "Customer reports car would not start." A few more questions could lead to a more specific complaint, "Customer reports car cranked over, but would not run." The second, more specific complaint could save you time and your customer money. The second type of problem involves a vehicle that exhibits intermittent problems while its engine is running, such as hesitation, stalling, bucking, pinging or racing. These can be the most interesting challenges to diagnose, but also can be the ones that send you home with a headache. If a customer reports a bucking symptom, the first thing we may investigate is the ignition. If the vehicle is bucking during inclement weather, try road-testing the vehicle after wetting down the secondary ignition components. If the vehicle is a late-model Ford, the torque converter may be suspect; it is a known weakness in some models. Last, but not least, is the intermittent problem that is not related to the engine or powertrain. Usually this involves an electronic device or an accessory and its wiring that are part of or added to the vehicle. Vehicles with these problems will do the best they can to fool you due to many variables or, as engineers say: "stack up of tolerance." Once you duplicate the condition, you will begin to develop a gut feeling to determine if the problem seems like a lack of fuel, ignition problem, etc. First, check for service bulletins on the system you think is suspect. c when the engine is hot or cold? c after a hot soak? c when a certain accessory is turned on or off? c during acceleration or deceleration? c when going uphill or downhill? Once you have the answers, advise the customer of the initial tests you will perform and the cost of those tests. Make sure the customer clearly understands that these initial tests may not find the problem, but most likely will point you to a certain system that needs specific testing. Our shop asks customers to authorize a ‘Level One Diagnostic.' 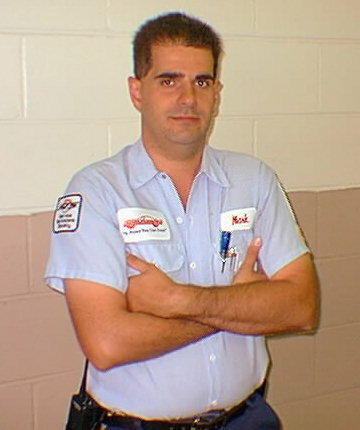 This package includes a visible (no tools), underhood inspection for obvious problems, a scan-tool connect fee and one hour of labor to cover the technician's time reading the datastream and road testing. After the initial tests are complete, you can begin formulating a differential diagnosis. In a differential diagnosis you look at the test results and the vehicle's symptoms, and list all the possible causes. You may actually discover the cause of the problem at this stage, but, generally, the vehicle will still require further testing to pinpoint the problem. If the diagnosis has gone on longer than you like, a call to a tech-line may be helpful. Contact the customer and ask if they will authorize additional testing time and/or other specialized tool costs. If the customer does give you authorization to continue, be sure to report the current status and cost updates after each actual billable hour you spend on the vehicle. Should the customer decide to halt the testing at some point, there will be no question as to the amount owed. An intermittent starting problem — specifically a "cranks but won't run" complaint — can be one of the most interesting, yet difficult problems to solve if it happens within the smallest ‘symptom window.' The symptom window is the actual time frame in which the vehicle is symptomatic. In some of the more difficult cases, the symptom window may be as short as one or two minutes, and any testing you hope to accomplish must be done during that small time frame. In the worst cases, the symptom window is short and the time between each occurrence is long, such as a vehicle that exhibits a problem for only one minute and that problem only occurs once per day. Let's take a 1998 Toyota 4Runner six-cylinder that we repaired as an example: This customer reported that once a day, the vehicle would crank but would not start. The vehicle was allowed to sit for several hours before attempting to start it. When diagnosing a starting problem like this, we usually install a spark tester on one of the plug wires, disconnect one of the fuel injectors and plug in a noid light. Generally speaking, if the vehicle will neither spark nor flash the noid light, it may be a crank sensor system problem; hence, you begin your differential diagnosis. In this case, a keen eye, past experience and a little luck afforded us a solution without the connection of any test equipment. Upon initial inspection of the 4Runner, one of the first things we noticed was that the ‘Check Engine' light was not illuminated at key on. Knowing that many electronic control modules (ECMs) have key-on power supplied from a relay, we pulled the ECM's schematic. The schematic shows that the key-on power source for the ECM comes from the EFI Main Relay. This relay is located in the underhood relay center. Leaving the ignition switch on, I tapped on the relay with my finger. Getting back in the driver's seat revealed that the ‘Check Engine' light was now on, and the vehicle started normally. With the aid of another technician I was able to turn the key on and off several times until I found a moment when the ‘Check Engine' light would not turn on; I signaled the technician to tap the relay again. Sure enough, the light came on immediately. Duplicating the problem several times can ensure that you have found the actual problem. We have seen this scenario more and more on a variety of different car lines, and so we now always check visually to see if the ‘Check Engine' light illuminates at key on. A 1994 Buick LeSabre recently repaired at our shop demonstrates the third type of intermittent problem very clearly. Well, that is, after the smoke cleared. The customer reported having an intermittent problem with the Buick's power door locks. All fuses in both the underhood and interior fuse panels were good. A search of our shop's computerized database did not reveal any service bulletins, but did show both the schematic and the location of the heart of the system: the power door lock/unlock relay. This relay is ‘conveniently' mounted to the metal body floor under the driver's seat. After you get the driver's seat unbolted and the rug rolled up, be sure you have a wet/dry vacuum cleaner handy; the location is inconvenient and dangerous. This is probably the 30th or 40th LeSabre body, (Pontiac Bonneville, Olds 88), that I have seen where the vehicle has had an inch or so of rainwater hiding under the carpet. The leaks stem from several different areas. The driver does not notice any water because the entire rug is rubber-backed which keeps the water hidden underneath. The water eventually works its way into the door lock/unlock relay, causing corrosion and resulting in anywhere from semi-operation of the relay to a totally dead relay. This vehicle was slightly different because another variable was added: Testing of the six-wire connector revealed that the orange power wire was dead. A study of the vehicle's splice schematic revealed that this wire runs from the relay into a main wiring loom, forward, under the sill plate, behind the emergency brake, up and out-of-sight in the dash. From there, it runs back down to the under-dash fuse panel, where it ends at a 30-amp circuit breaker. The orange wire had 12 volts where it exited the circuit breaker, but had 0 volts when tested in the loom under the sill plate. The wire was open somewhere high in the dash. In many cases like this, you can either spend some big labor dollars locating the open or save the customer some cost by running a new wire. We chose the latter. 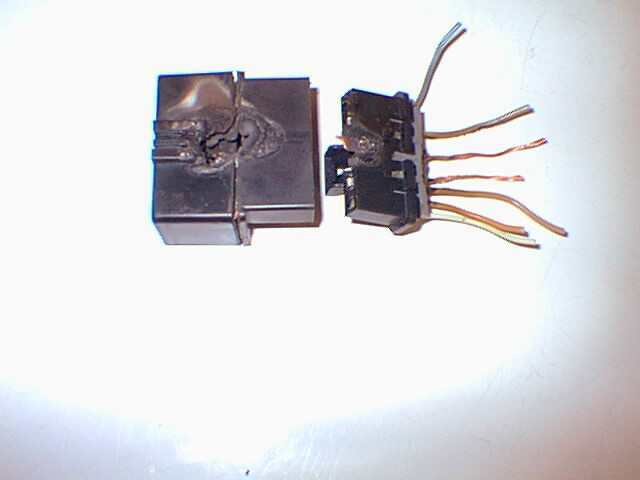 A wire of similar gauge was soldered in from the circuit breaker down to the relay's connector. This is where the fun began. We reconnected the battery and tested the locks. The power locks now worked; however, they only locked. They would not unlock from any switch. I stopped work to take a phone call. While on the phone, I glanced back and saw plumes of gray and white smoke billowing out of the vehicle's interior. The stink of melting plastic reeked through the shop. Fortunately, my brother quickly disconnected battery. At first, I feared that my wiring job was done incorrectly. However, a recheck of the wiring diagram proved that my work was correct. The only damage to the vehicle was the lock/unlock relay and its harness connector plug. As you can see in the picture, it was ‘well done!' The connector also was destroyed. We developed a theory based on a similar experience with another Buick that had a similar lock problem: This vehicle developed a water leak that corroded and damaged the lock/unlock relay and connector terminals. At some point, the vehicle also developed an unrelated open in the orange power wire, which resulted in no operation at all. Our repair and repowering of the compromised relay caused the meltdown. After a new relay and connector were spliced in, all the locks worked normally. You should note that there is a recall on the 1994 Buick Century and Olds Ciera because the relay location can cause corrosion and possible fire. On those vehicles, the relay and connector are mounted in the A-pillar adjacent to the door hinges and this location is very susceptible to rain water. The LeSabre has not been recalled because its relay is not in a location susceptible to water damage. Or is it? Incidentally, customers typically do not want to bother with the expense to locate and repair the water leaks. In light of that, I will place the relay on top of the rug under the driver's seat to keep it out of the water. There's no doubt that intermittent problems are becoming more frequent as vehicles are built with more electronics. Hopefully you can apply the ideas presented here to some of those future problems.